Imagine my delight to open the Sunday LA Times yesterday and to find THIS ARTICLE! I have seen photos of these aquascapes on the internet but have never really thought of them as terrarium gardening until now! 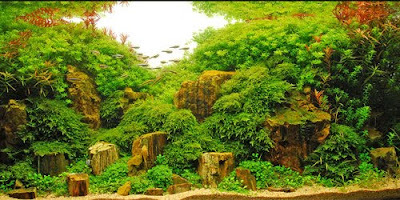 The article covers many of the ups and downs of this challenging craft as well as information on the international design competition for aquascapes. Pretty neat stuff. His aquariums borrow ideas from Japanese flower arranging, Zen rock arrangements and the idea of wabi-sabi -- that imperfect is beautiful. "It is important the tank doesn't look too symmetrical," Steven Lo said. "There is a lack of dynamic tension." Amano is very famous but in his own circles and definately one of the best aquascapers in the world. They really are amazing. I wish I could do stuff like that! What a fantastic peace of art and nature.